Several residents of Playa Del Rey Estates say they're concerned about decisions made by their homeowners association board members and the financial impact actions may be having on the neighborhood. Copies of financial statements for the posh Gilbert neighborhood provided by residents show the HOA had less than $15,000 in its bank accounts as of June 30. Residents say they suspect this is unusual and less-than- ideal for a neighborhood where the average home value is more than $300,000 and residents pay more than $130 per month in assessments. Moreover, they say they're concerned about decisions made by HOA leaders that may have led to large amounts of money being spent from the accounts without specific approval of a majority of the residents. has managed the community's lake. costs of draining and repairing two lakes in the community, and attorney's fees for lawsuits, among other expenses. About $30,000 of the special assessment went to cover costs of the HOA draining and refilling its water-ski lake for repairs and for residents to build boat slips on the lake, documents show. Residents voted in March to approve the special assessment. Many of them said they feared a "no" vote would mean bankruptcy for the HOA and a harsh impact on their home values. But now residents such as Joe Bedgood are wondering where that money went and how long it will be before board members are asking residents for thousands more in special assessments. "I think we're running out of money," Bedgood said. Resident John Aldridge said he's been concerned about the HOA's finances since he moved into Playa Del Rey in 2001, but has repeatedly been denied access to HOA records that would answer his questions. Gilbert records show that at one point, the neighborhood's HOA owed the town more than $78,000 in past-due water bills. Several payments were made, and the total owed was brought down to $59,086. But records show the town agreed to let the HOA pay $33,000 at $1,000 per month as full payment for the past-due water bills, and the town will have to write off $26,086 as bad debt that will go uncollected from the HOA. Town officials said they could not comment on this specific case, but that the town sometimes decides to write off money owed to the town as bad debt as part of a settlement negotiation. Kevin Bishop served as the HOA board treasurer until resigning in January, citing concerns over the board spending "unauthorized funds." As the owner of a Valley community management group, Bishop said he's well-versed in HOA laws and procedures, and did not think the board was following proper procedures. Bishop and other residents said the board was not getting residents' approval before spending money on projects and attorney's fees. "The board has told us directly that they don't speak for us," said resident Richard Rivera. "They do as they please." 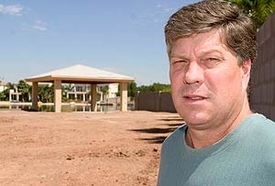 In December, the HOA filed a lawsuit against the neighborhood's developer, Alexander Zink, alleging that he underfunded reserve accounts and failed to properly raise assessments to provide for the financial health of the HOA. The lawsuit charges that Zink owes the HOA an unspecific amount in the hundreds of thousands of dollars in unpaid assessments. Records show the developer has filed a countersuit, alleging that the HOA drained its lake unnecessarily, and sought to sue the developer after costs exceeded original estimates and it needed more money. Steven Cheifetz, attorney for Zink, said his client decided to file the countersuit because the HOA spent money "recklessly" and then sought to get money from Zink once it was in "a bind." Curtis Ekmark, an attorney representing the HOA board in the countersuit, said his clients were "eager to tell their side of the story," but he would not allow them to comment because of the pending lawsuits. Several residents also question why board members who are named individually in the lawsuit have not resigned their HOA board positions until the lawsuit is resolved to avoid a conflict of interest. Bishop asked several of the board members to resign at a recent HOA meeting and they declined. He and other residents question if the lake draining was a necessary expense, or whether it was done solely so several HOA board members and some of their neighbors could build boat slips and ramadas. Bedgood, Rivera and other residents said they were reluctant to approve the $1,000 special assessment, but they feared for property values and saw it as the only way to get water back in the lake and the suit against the developer going. "We have concerns about how things were manipulated," Rivera said. The residents say that anyone who requests financial records from the HOA board or its attorney, or anyone who speaks out against the HOA, is dubbed as a dissident who's trying to aid the developer's countersuit.